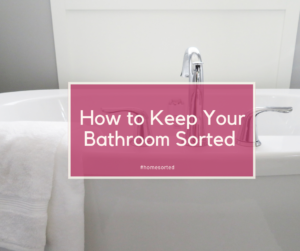 How to Keep Your Bathroom Sorted - Home Sorted! Are you looking for a way to streamline your bathroom time? With the right organisation tricks you can turn your bathroom into a place of zen and shorten the time it takes to get ready of a morning. We absolutely cannot get enough of clear storage containers. These gems are perfect for storing items such as cotton balls and cotton buds. They can also be used without lids to house make-up brushes, lipsticks, and other bathroom odds and ends that you use frequently. Clear storage containers always get out tick of approval as they allow you to see what’s inside, which is especially great for items you run out of quickly. So many people think drawer dividers belong solely in the kitchen. This couldn’t be more untrue, with dividers offering a fantastic solution for make-up organisation within the bathroom. You can separate your make-up by kind, or frequency of use. The choice is yours! But what is certain is that the time you spend getting ready will reduce when you’re not spending time sorting through deep, dusty make-up bags. This is a nifty trick that has a multitude of purposes. Consider installing hooks inside your vanity cupboard doors to store hangable items such as hairdryers and straighteners. You can also hang a micro-fibre cloth inside your vanity cupboard to encourage family members to give the bathroom sink a quick wipe down after each use! Are you short on space in the bathroom? If you’re nodding yes, it may be time to consider over the toilet shelving for some much-needed storage solutions. This area can be utilised for towels, toilet paper, bath toys for small children, spare toiletries and looks especially great when items are grouped together in baskets – bringing us to our next point. If you find yourself struggling to organise odds and ends within the bathroom, we recommend investing in some baskets to keep items clustered together – but still within reach. These can be stored within your vanity cupboard, space permitting, on over the toilet shelving, or even beneath cupboard and drawers depending on the setup of your bathroom.